Karen Tórrez wins gold for Bolivia! 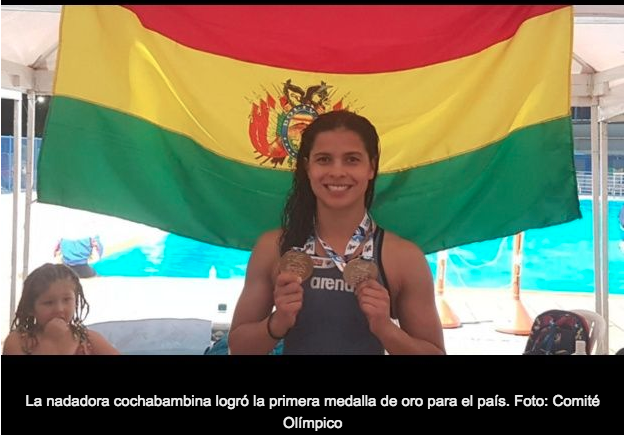 The Bolivian swimmer achieved the first gold medal for the country after winning the 50 meter freestyle event at the Bolivarian Games in Santa Marta (Colombia). 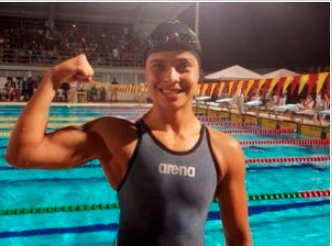 Bolivarian swimmer Karen Tórrez on Wednesday [11/22/2017] gave her country the first gold medal of the XVIII Bolivarian Games by winning the 50 meter freestyle event in which she also imposed a new Bolivarian record. Tórrez hung the golden medal with a time of 25 seconds and was followed by the Colombian Isabella Arcila, who finished at 25 thousandths and was left with the silver metal. The host could not sustain the advantage that reached in the first meters of the race and lost because the Bolivian finished better. The bronze was taken by the Ecuadorian Rain Delgado with a time of 25:81 seconds. “I am very happy for the first gold medal of Bolivia in these Games, for the Bolivarian record and for the tremendous mark that I made in the 50 meters,” Tórrez told EFE after winning the gold medal. The race also included the Ecuadorian Camila Demarquet, the Bolivian María José Rivera, the Venezuelan Jeserik Pinto, the Colombian María Paola Muñoz and the Salvadoran Elisa Funes. In the medal table, Bolivia is left with one gold, eight silvers and 12 bronzes completed a good part of the twelfth day.